Dr. Neeman’s debut album, Rachmaninoff & Sitsky, was released to wide acclaim in March 2016. The album includes a premiere recording of the Piano Sonata No. 1 by Larry Sitsky, written especially for him. Dr. Neeman also has released a live recording of the Concierto para piano by Joaquín Rodrigo on the Rodrigo Foundation label, andl as a collaborative CD with trumpeter Jason Dovel which was lauded for the players’ “nuanced, stylistic interpretations and technical mastery” by ITG Journal. An enthusiastic collaborative artist, he has performed with musicians including Itamar Zorman, Abigail Fischer, Ben Capps, and members of the JACK quartet. Dr. Neeman has made numerous piano duet arrangements for the Neeman Piano Duo, in which he performs with his wife, the Indonesian pianist Stephanie Neeman. He also enjoys accompanying ballet and performed with the American Ballet Theater in their 2014 tour of Japan. Dr. Neeman’s published research includes his doctoral dissertation on free improvisation and graphic scores, an article on the chamber music of Larry Sitsky, published by ANU E Press, and pedagogical articles in STACCATO, an Indonesian music magazine. He has developed an innovation in the mechanism of the piano’s sostenuto pedal that allows the sostenuto and damper pedals to be combined in new ways, and has given presentations on its ramifications for pedaling technique at the MTNA National Conference in the United States and the Australian National Academy of Music. Dr. Neeman’s interest in microtonal music has inspired him to transcribe quarter tone works by Charles Ives, Ivan Wyschnegradsky, and Alois Hába for MIDI keyboard. Originally written for a specially designed quarter tone piano, these works can now be performed by a single pianist as intended by the composers. Dr. Neeman regularly gives masterclasses around the world. He has been a jury member for the Mozart International Piano Competition in Thailand, the Hong Kong Schools Festival, the Jakarta Conservatory National Competition, the West Australian Pianists Competition, and numerous competitions and festivals in the United States. He has taught at Utah Valley University and currently a piano lecturer at the Australian National University. He also holds the position of Artist Faculty at the ELMS Conservatory in Jakarta, Indonesia. Themes of death and the struggle for rebirth intermingle on this album of Rachmaninoff's sombre Etudes-tableaux, Op. 39, and Larry Sitsky's Sonata No. 1, "Retirer d'en bas de l'eau", which is based on an ancient Voodoo ritual. Free and open-source recordings of the complete Chopin Études and 31 selected Mazurkas, courtesy of MusOpen. These acclaimed recordings are available for general use. Live performances from around the world. Amid the cobwebs of almost-forgotten piano history lies the strange story of the quarter-tone piano. 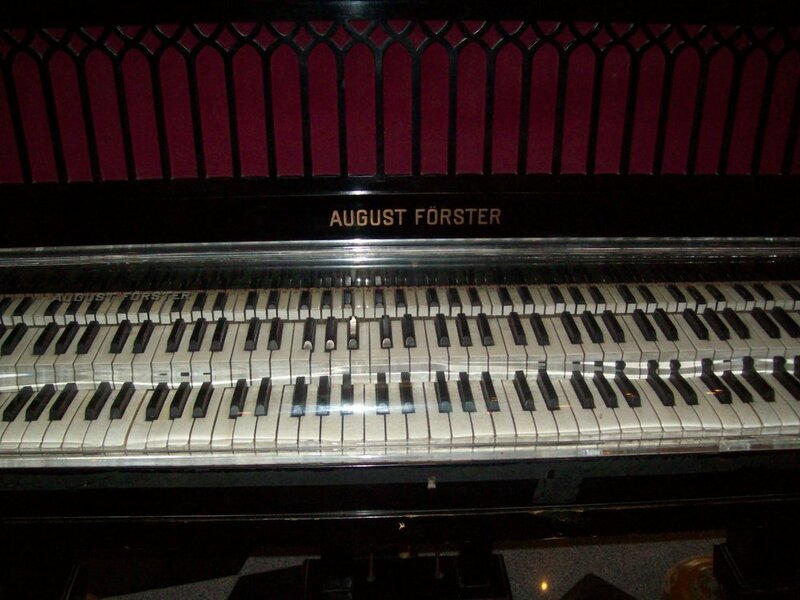 Alois Hába, Ivan Wyschnegradsky, and Charles Ives were the vanguard of quarter-tone piano composition, writing ground-breaking works for quarter-tone pianos developed by August Förster in Europe and George Weitz of Chickering Pianos in the USA. While acoustic quarter-tone pianos are scarce as hen's teeth, these pieces can be resurrected by the intrepid twenty-first century pianist with the aid of a MIDI keyboard and virtual piano technology. On an acoustic piano, the damper pedal normally interferes with the sostenuto mechanism in a way that can cause all the dampers to be caught on the sostenuto pedal. Hacking the pedal mechanism by restricting the damper pedal motion results in an independent sostenuto pedal that is completely unaffected by the damper pedal. The independent sostenuto pedal expands the technique of double pedaling, or using the damper and sostenuto pedal at the same time. There are three basic techniques: joint pedaling, overlapping pedaling, and the partial sostenuto. My doctoral dissertation “Free Improvisation as a Performance Technique: Group Creativity and Interpreting Graphic Scores” (The Juilliard School, 2014) discusses the practice of free improvisation as practiced by improvising groups in the 1960s and 70s, and argues that the techniques and skills involved can be tools for interpreting graphic scores. As part of my lecture recital on Catch 2 (1968) by Roman Haubenstock-Ramati, I gave an improvised interpretation of this graphic score. In my sample recording of excerpts from the Piano Concerto (2008) by Joel Hoffman, I improvised a cadenza based on the concerto's unique 68-note scale. Two complete improvised cadenzas are available here and here. “Sitsky’s Chamber Music,” (2008–9) is my contribution to Larry Sitsky’s comprehensive survey of the Australian chamber music repertoire with piano. Published by the Australian National University EPress. Was It Really a Dream? (2011) for solo piano. 4 minutes. Prelude after Scriabin (2009) for solo piano. 2 minutes. Variations on “I Got Rhythm” (2006) for solo piano. 9 minutes.